Since this first discovery, two other smaller craters have been spotted in the surrounding regions, fueling even more armchair conjecture. Russian scientists sent to the site are now providing first-hand data showing that unusually high concentrations of methane of up to 9.6 percent were present at the bottom of the first large crater shortly after it was discovered on July 16. Andrei Plekhanov, an archaeologist at the Scientific Centre of Arctic Studies in Salekhard, Russia, who led an expedition to the crater, told The Journal Nature that air normally contains just 0.000179 percent methane. The last two summers in the Yamal have been exceptionally warm at about nine degrees Fahrenheit above average. According to Plekhanov, the last two summers in the Yamal have been exceptionally warm at about nine degrees Fahrenheit above average. Rising temperatures could have allowed the permafrost to thaw and collapse, releasing the methane previously trapped by the subterranean ice. Methane is the primary component of natural gas. The original crater is about 20 miles from a large natural gas plant and the entire Yamal Peninsula is rich in natural gas that is being extensively tapped to help fuel Russia’s natural gas boom. Hans-Wolfgang Hubberten, a geochemist at the Alfred Wegener Institute in Potsdam, Germany, told Nature that climate change and the slow, steady thaw of the region could be to blame. “Gas pressure increased until it was high enough to push away the overlying layers in a powerful injection, forming the crater,” he said. This frame grab made Wednesday, July 16 shows the 200-foot wide crater discovered in the Yamal Peninsula. While staring down into the abyss of these craters is a scary thought, the release of large quantities of greenhouse gases from melting permafrost is existentially daunting. A study from earlier this year found that melting permafrost soil, which typically remains frozen all year, is thawing and decomposing at an accelerating rate. This is releasing more methane into the atmosphere, causing the greenhouse effect to increase global temperatures and creating a positive feedback loop in which more permafrost melts. “The world is getting warmer, and the additional release of gas would only add to our problems,” said Jeff Chanton, the John Widmer Winchester Professor of Oceanography at Florida State and researcher on the study. According to Chanton, if the permafrost completely melts, there would be five times the current amount of carbon equivalent in the atmosphere. Kevin Schaefer, a permafrost scientist at the National Snow and Ice Data Center, told ThinkProgress that there are actually two sources of GHGs released by melting permafrost: methane hydrates that destabilize when permafrost temperatures rise, as has been the case in Siberia, and frozen organic matter. He said that as the permafrost thaws, the organic matter will also thaw and begin to decay, releasing CO2 and methane into the atmosphere. “Published estimates indicate 120 gigatons of carbon emissions from thawing permafrost by 2100, which would increase global temperatures by an additional 7.98 percent,” he said. As with other processes in the permafrost zone, abrupt changes appear to be as or perhaps more important than slow gradual change. Schaefer said the phenomenon of the Siberian craters was a surprise to him because he thought the methane would leak out more slowly. Capturing these large bursts of methane before they enter the atmosphere could be possible, according to Schaefer, however extremely difficult. He said that capturing the emissions from decaying organic matter would be impossible. 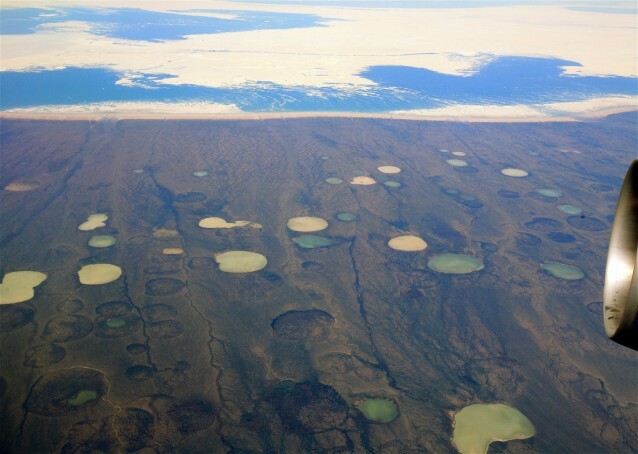 Ted Schuur, a professor of ecosystem ecology at the University of Florida and leader of the Permafrost Carbon Network, told ThinkProgress that the Siberian craters remind him of ‘hot spots’ of methane bubbling that occur both in lakes and undersea in the permafrost zone. A survey of 41 permafrost scientists in 2011 estimated that if human fossil-fuel use remained on a high projection and the planet warmed significantly, gases from permafrost could eventually equal 35 percent of present day annual emissions. In the few years since then, emissions have continued to rise. If emissions are heavily curtailed, greenhouse gases from permafrost could make up as little as around the equivalent of 10 percent of today’s human-caused emissions. This is far lower, but still highly disconcerting.